We all know that speed kills, but speed often can be a self destructive weapon. One fast gun is deadly; two fast guns can blow up in your face. In Bayern and Moreno, we have two dangerous weapons, which individually would be deadly for everyone else in the Breeders' Cup Classic field, but together could spell disaster for each other. Bayern's trainer, Bob Baffert, is still trying to recover from the devastating loss of American Pharoah, who was his main focus in this year's Breeders' Cup and who he considered as brilliant a 2-year-old as he's ever trained. Baffert realizes he has arguably the fastest horse in the Classic, but he also realizes the presence of Moreno could greatly hamper his colt's chances, especially at 1 1/4 miles. Bayern finished 10th in the 10-furlong Travers Stakes and ninth in the 1 3/16-mile Preakness Stakes. But his races at 1 1/8 miles have been nothing short of brilliant. When it was suggested that he has to be happy to have a horse as talented as Bayern in the Classic, Baffert said, "I'll only be happy when I see how he's running at the seven-eighths pole. If he's doing everything on his own I'll be happy then." But will he be on the lead fighting with Moreno? Baffert didn't want the son of Offlee Wild doing too much in his last work and gave him a maintenance drill, keeping him off the flank of stablemate American Pride. Bayern went the five furlongs in 1:00, which is like breaking stick for that colt. In the Moreno camp, trainer Eric Guillot is just thrilled to have the son of Ghostzapper still on the top of his game following a pretty grueling seven-race campaign, which has seen the gelding compete in four grade I stakes, two grade II stakes, and a grade III stakes. His best performances have been when he was on a clear lead, and Guillot is not about to give up Moreno's best weapon. "You wouldn't believe what I've had to go through to get this horse here," Guillot said of Moreno's many physical issues. "Bayern has been able to get easy leads in all his races. It'll be a different story this time. I just wish I were outside Bayern (who drew post 7, with Moreno breaking from post 4)." So the battle lines have been drawn. As of this writing, there have been no defections in the Classic, which is important in that the horse waiting to get in off the also-eligible list, Big Cazanova, is a hard-knocking 5-year-old who is also loaded with early speed and who actually outran Moreno in the recent Jockey Club Gold Cup. Let's assume Moreno, on the inside, and Bayern, outside of him, will hook up early, although in many cases such as this, something happens at the break and one horse finds himself alone on the lead, which could prove to be disastrous to the rest of the field. California Chrome drew a terrific post out in the 13-hole, which is where Art and Alan Sherman want him. The son of Lucky Pulpit has finished out of the money five times in his career and they were the only times he was down on the inside or stuck between horses. So, an inside post in the Classic could have ended the Derby and Preakness winner's chances before the race was even run. Seeing how sharp the colt has been since arriving at Santa Anita from Los Alamitos, dragging his exercise rider around every morning, it is hard to envision him being too far off the pace. He is going to have to break sharply from the 13-post and outrun a number of classy horses in order to get a good position going into the first turn. But ground loss is a far lesser evil for him than being down on the inside. Another post of interest is Cigar Street drawing post 2, which his connections feel is not ideal, but looked on the bright side by saying it's at least the shortest way around there. Cigar Street is a big, powerfully built son of Street Sense and you don't have to stop riding him, but you can bet Johnny Velazquez will get him to settle in a nice position behind the top three and wait for an escape route to open up. Behind the first four should be the 9-5 favorite Shared Belief, breaking from post 6, and the European invader Toast of New York, who drew post 9. So there is a possibility that Shared Belief could be in a little traffic if Toast of New York shows speed. The horse we're not sure of is Tonalist, who has shown good tactical speed, but came from 10th to win the Jockey Club Gold Cup after trainer Christophe Clement removed the colt's blinkers. But he also broke awkwardly after appearing to hit the side of the gate when he veered out and then back in. At nearly 17.1 hands tall, he relished the big sweeping turns at Belmont, but has shown enough athleticism and the ability to overcome traffic to suggest he will not have any problems on the smaller Santa Anita oval. As for the others, they pretty much are late closers, with Prayer for Relief and Footbridge mainly mid-pack runners, and post positions should not affect them. They certainly shouldn't affect Imperative (post 3), V. E. Day (post 5), Zivo (post 8), Candy Boy (post 12), and Majestic Harbor (post 14). It is these five horses who would benefit most from a speed duel and scorching early fractions. So, keep a close eye on the start and how Bayern and Moreno break and whether or not they both are committed to the lead, even at the expense of both horses. And then take a look to your left and see where California Chrome is and if he has to go wide into the turn. You can then look in the group directly behind the leaders and see if little Shared Belief has a clear run or is stuck between Cigar Street and whoever might be to his outside, such as Tonalist or Toast of New York. He sure doesn't want the towering Tonalist laying all over him or blocking his way out. As for Tonalist himself, he is one horse where it doesn't matter where he is. He can strike from anywhere. As for the five stone closers, you have plenty of time to watch for their bids. They'll be flying around the far turn. If Frankie Dettori can time Imperative's move right, he might have the best turn of foot of the closers, who are most effective with their late runs. This should be a humdinger of a race, and there is little room for jockey error. Let's all hope for a clean trip for everyone and may the best horse win. 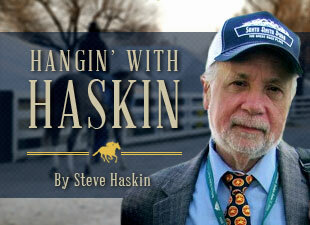 I'll be starting my longshot picks and exotic betting strategy in tomorrow's column, covering the Friday races. Saturday's big card will be covered on Friday.